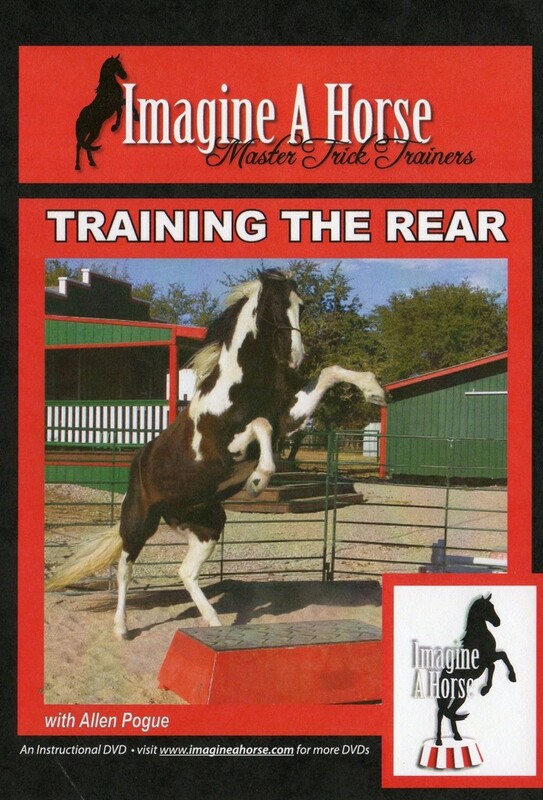 The Trick Horse Companion book and the 15 Imagineahorse DVDS are the most complete Trick Training method in the world. 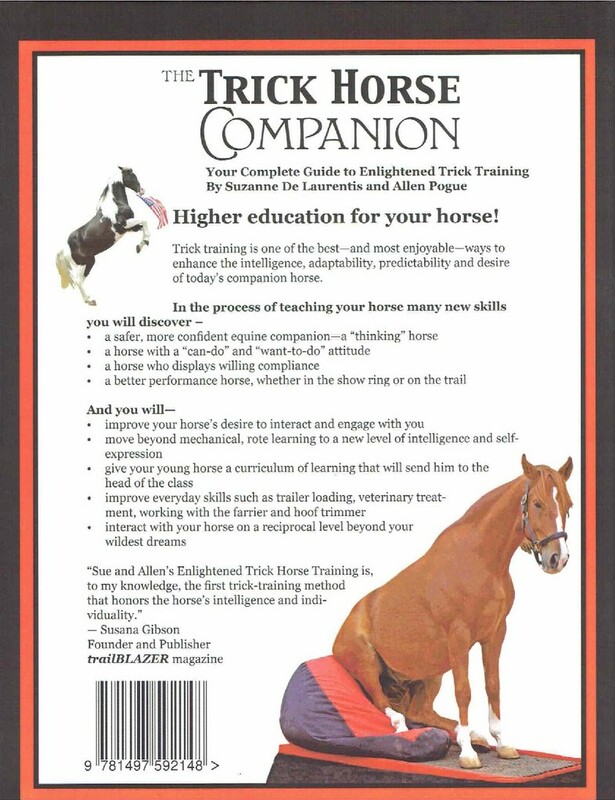 This book is the most detailed and comprehensive academic work on the science and art of Trick Horse training ever published. $3.60 Media mail Shipping included in price. For International shipping scroll to the bottom of the dvd selection and click on the button that will charge for International Priority class option. 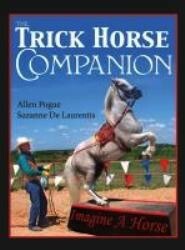 "Sue and ALlen's Enlightened Trick Horse Training (the method outlined in the book) is...the first trick-traning method that honors the horse's intelligence and individuality." –Susana Gibson, Founder and Publisher, TrailBLAZER magazine. 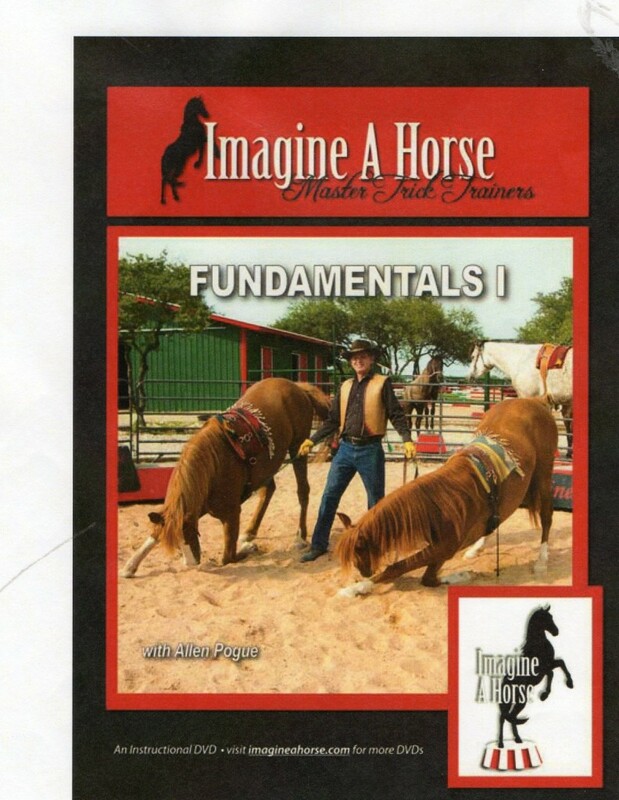 This book helps you create your Ultimate Companion Horse. Create strong emotional links with and enthusiastic responses from your horse that up to now you have only dared to dream. 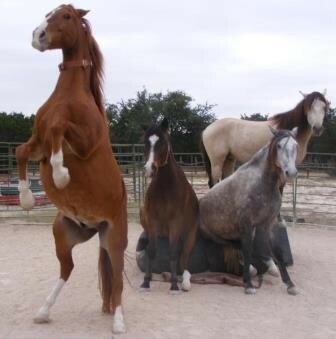 Every specialty move a horse makes is a trick. This includes clearing a jump, sliding to a perfect stop, bowing for an audience. We show you How to train the moves and also explain WHY each move improves the willingness and yes, happiness of the horse. 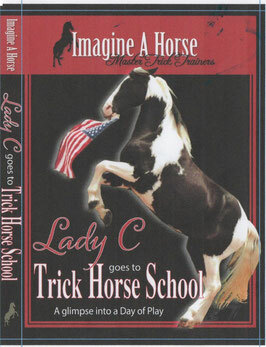 Horses love to learn with the methods that we've developed over 36 years devoted to Trick Horse Training. Over 300 color photos with dozens of horses of many breeds, sizes and ages show you the step by step details found no where else! 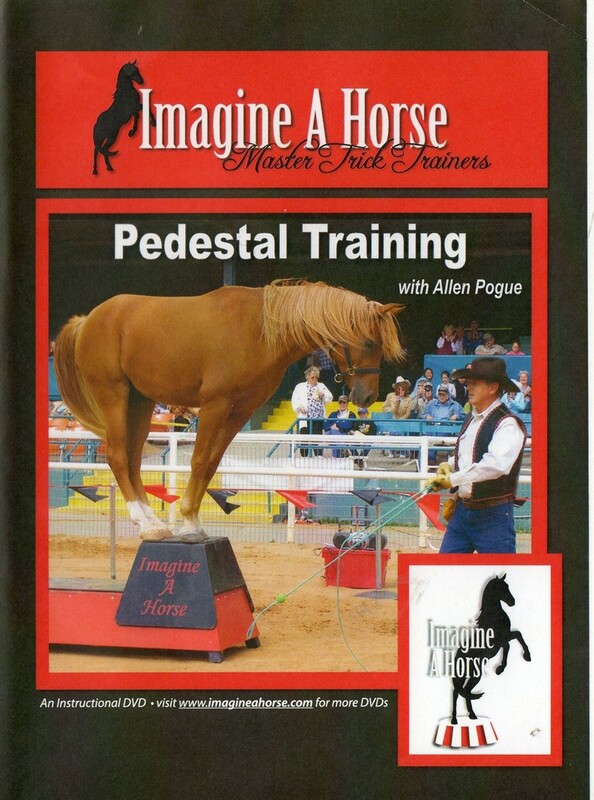 Pedestal Training—the centerpiece of modern Trick Horse Training. 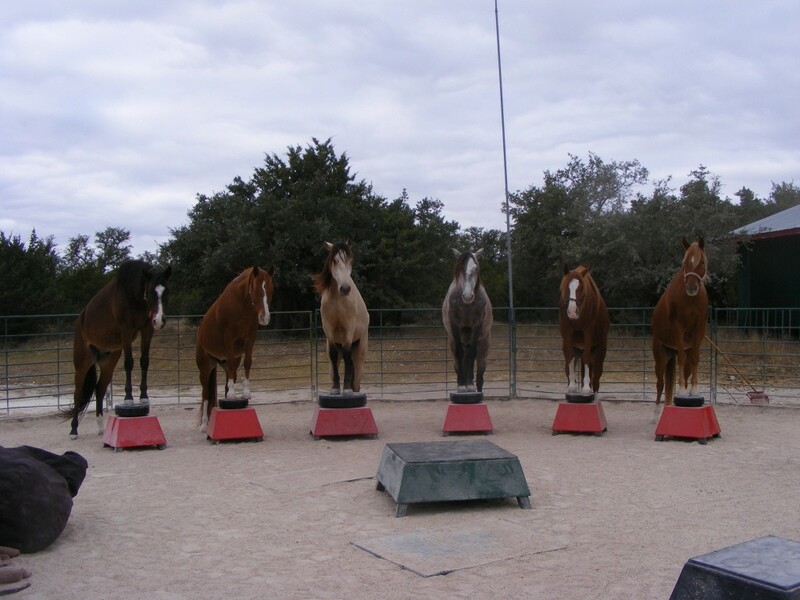 Big cats, birds, reptiles, elephants and agility dogs are all trained using a pedestal or “mark.” Horses may benefit from Pedestal Training even more than other species because they are flight animals. The Pedestal gives the horse a safe place to stand and an avenue of expression that doesn’t trigger the flight response. Tricks of Trust include the Obeisance or Circus Bow, the Bow, Kneel and Lie Down. These are moves in which a horse learns to lower his eye and his body in relation to the handler’s, putting him in a position that requires great trust in his handler. Tricks of Engagement include smiling, retrieving an object such as a Frisbee, flag or cap or learning to actually control a big ball. Tricks of Agility include the Salute (Jambette), the Rear and Hind Leg Walk, the Sit Up and Sit Down. Tricks of Gait- Spanish Walk. Liberty Training- Whether it’s one horse working solo, a pair or a troupe of three or more, the horses respond to the handler’s cues without any attachments. 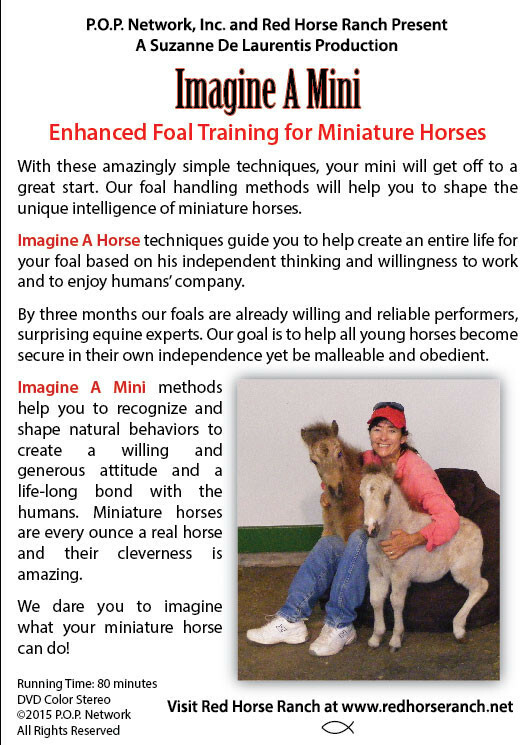 Miniature horses are more popular than ever! People are partnering with them as therapy pets and service animals and as a more economical alternative to their larger cousins. 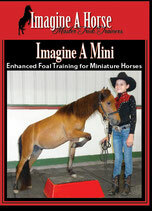 Miniature horses are more portable, less flighty and can live longer than average sized horses too. They make excellent companion animals for so many reason, and especially so when they are offered a training program designed just for them. 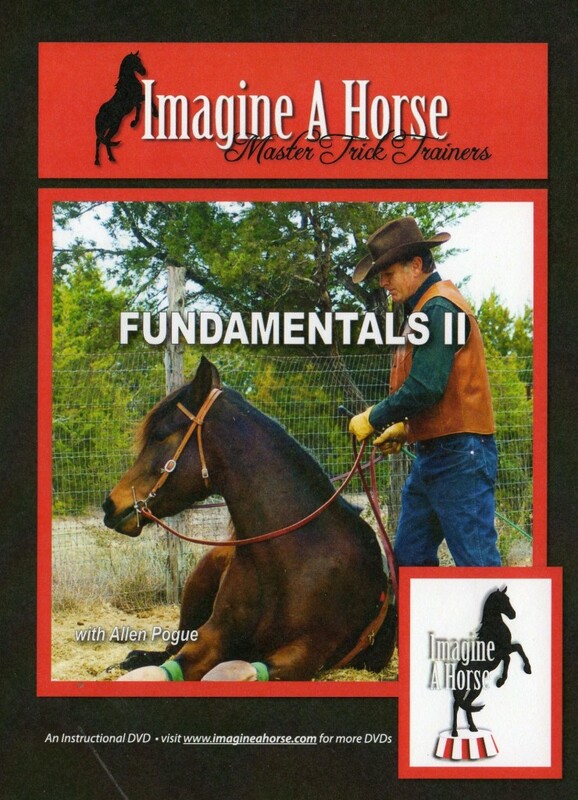 The DVD runs an hour and twenty minutes and covers an assortment of training situations and settings viewers can recreate in their home environment. Viewers are also introduced to equipment useful in the training process. 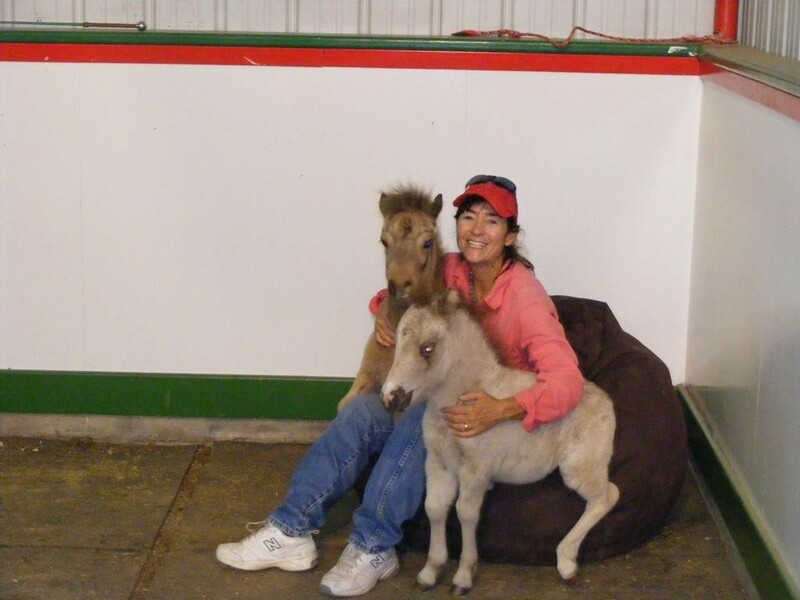 Working with three different foals with noticeably distinct equine personalities; Cara, Miko and Sophie, both Allen and Suzanne demonstrate their individual approaches giving the viewer a variety of options they can personalize and make their own. Food Treats are used in training animals of all species. 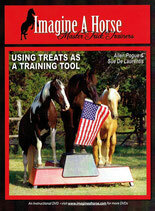 Treats can be used effectively and responsibly with horses too! We have presented many cool ways to use food treats for training your horse and maintain his good behavior including methods to stop mugging. The introduction features Bobbie Colorado and her dog, Shamus. Bobbi has trained all species of animals and explains why food treats work. (www.bobbicolorado.com). Imagine a Horse shows you how to use food treats in under saddle work and in trick horse training with methods that anyone can use. 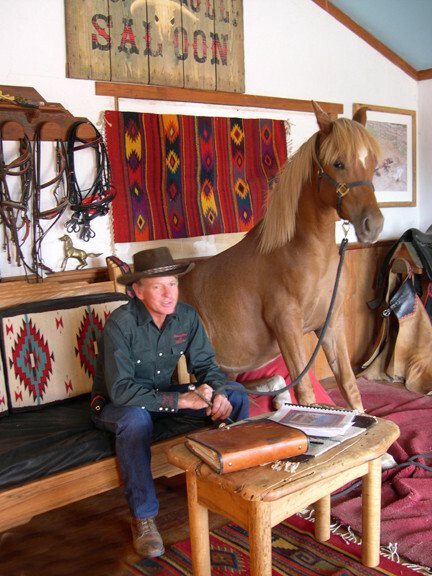 The most common request we receive is from folks that want to come to the ranch and watch us train our horses. For many the distance is too great for convenience so we created this DVD so you can be the "fly on the wall" and follow Allen around as he schools six different young horses through 22 different tricks. This is not a step-by-step instructional video, instead it is a unique opportunity to see what training looks like in real time. The second half the the video is an informal performance with three of our adult Liberty horses. There is a wealth of useful knowledge contained in the one of a kind video. 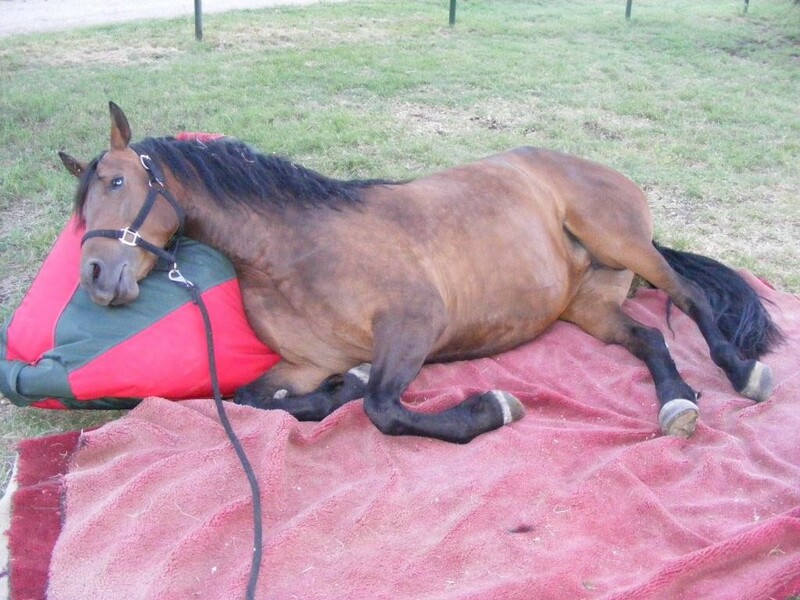 Stop your horse from mugging and getting into your space. Nip Buster is a palm sized spray that contains citrus essence. 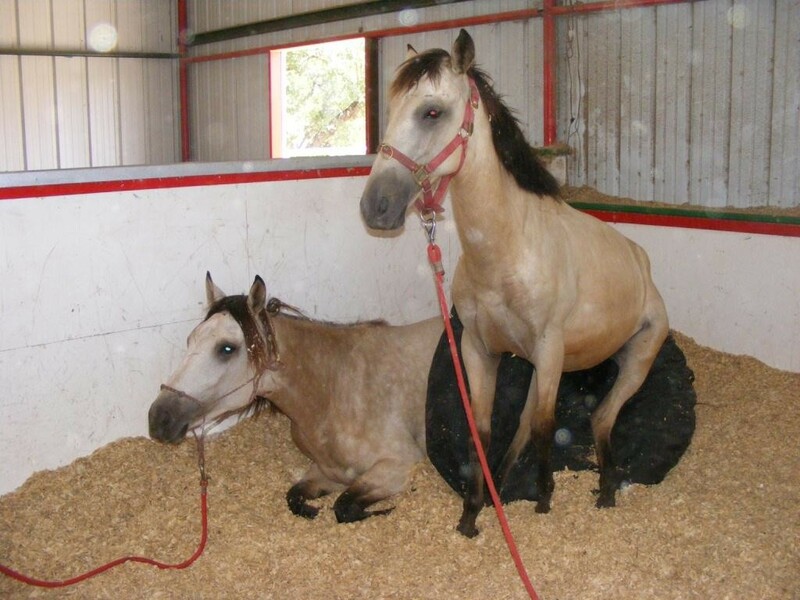 Help your horse keep his manners and even solve problems such as biting. Easy to use and safe enough to spray into your own mouth. This is one of our favorite tools. 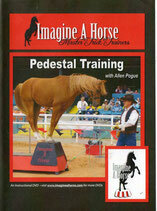 How and Why of Pedestals Training for the Trick Horse. This just might be the most important behavior you will ever teach your horse! Imagine A Horse is the only place you can find out how it relates to horses! Create trust and willing obedience with effective and humane methods that are based on positive reinforcement. Special attention to details for the safety and comfort of the horse. When the horse has learned the lessons of Fundamentals I, he is ready to go on to learn the Lay Down, Sit Up, Sit Down. 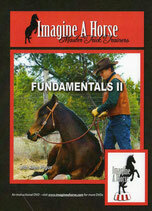 Never before shown humane methods with emphasis on handler safety and the comfort of the horse. Package price for both items. Four different horses learn the Spanish Walk with Allen Pogue. 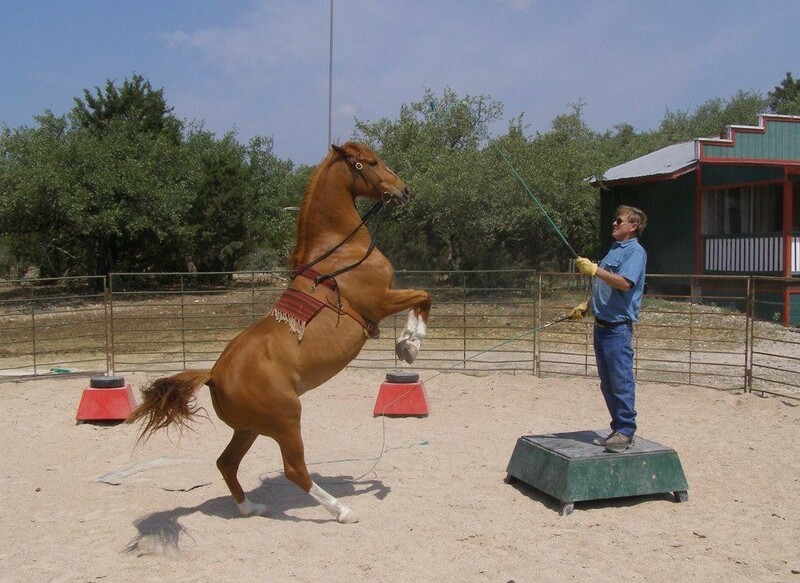 The Jambette is taught as the foundational move and is “shaped” as the horse progresses. Logical steps, taught on the ground and easily transferred to saddle work. 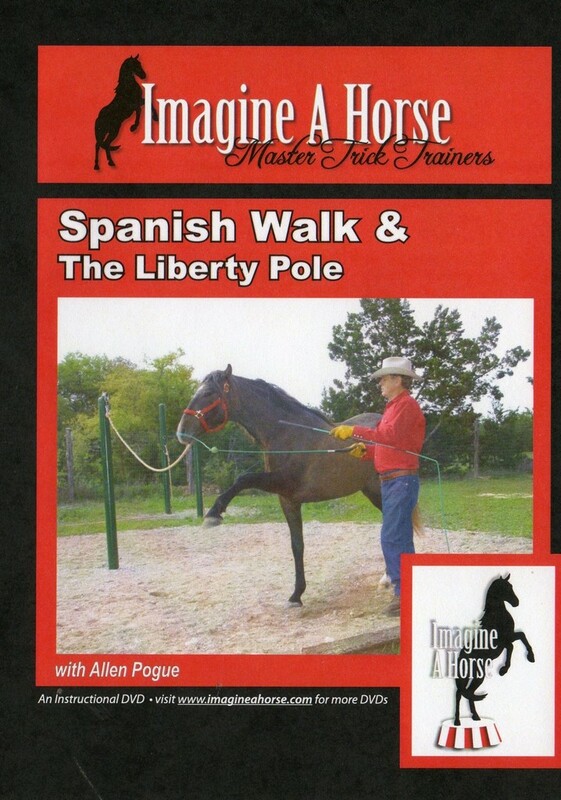 Includes the lost art of the Liberty Pole-a well kept secret of the Spanish. Nobody trains foals like we do at Imagine A Horse. Learn how to give your foal the best possible start in life. Dr Robert Miller, the author of Imprint Trainimng The Newborn Foal says that our results are so remarkable that he would have not thought it possible. 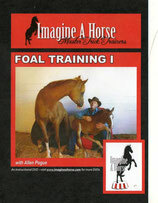 Foals "learn how to learn" which will result in a happy, confident and intelligent horse. This will be the best $$$ you will ever spend! Expand the possibilities for educating a new foal or weanling. 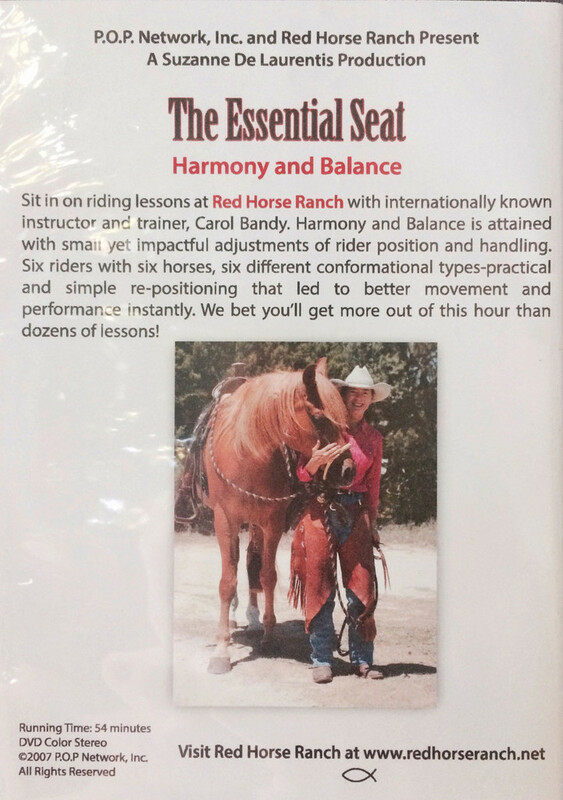 This method is the best "head start" that one can give a young horse! Expand the possibilities for educating a new foal or weanling. 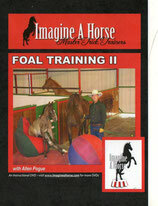 Age appropriate challenges and exercises, exciting educational ideas for foals, limited only by your imagination. If you want to raise the most intelligent and willing adolescent possible, this is the training program that you need. 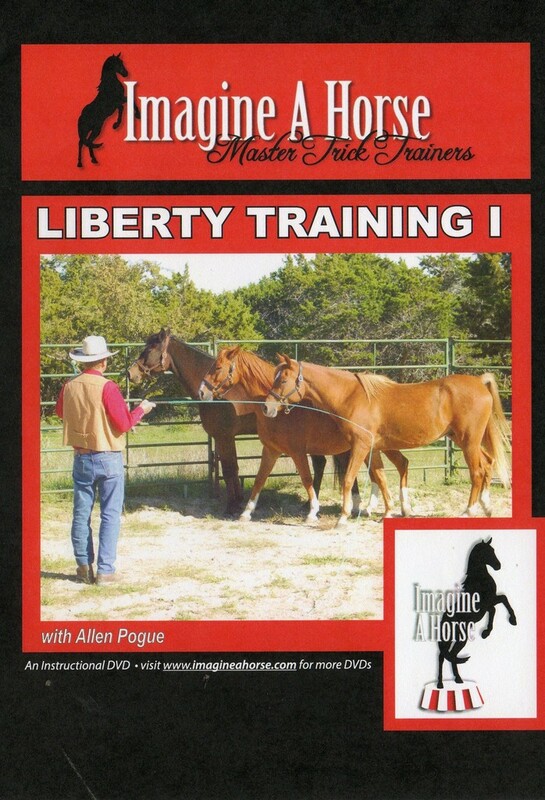 Liberty lessons when taught as partof a young horse's primary education can help to form the foundation upon which any other preformance discipline can be taught. 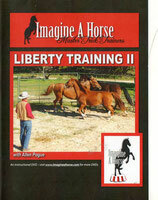 Learn how to foster the individuality of each horse and encourage team work with more than one foal. These age appropriate challenges teach confidence, reliability and self carriage. 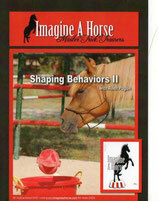 Patterns and exercises to bring out the intelligence and cooperation in a young horse. 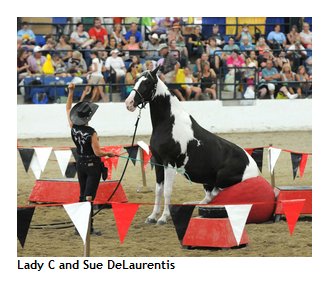 Detailed instructions to teach patterns, simple to complex with one horse or up to four horses to create circus-style sorting routines. Horses learn to be responsible for their actions, respond reliably as individuals while performing as a team. Detailed and incremental instruction for the Smile, the Salute and herding the Big Ball. 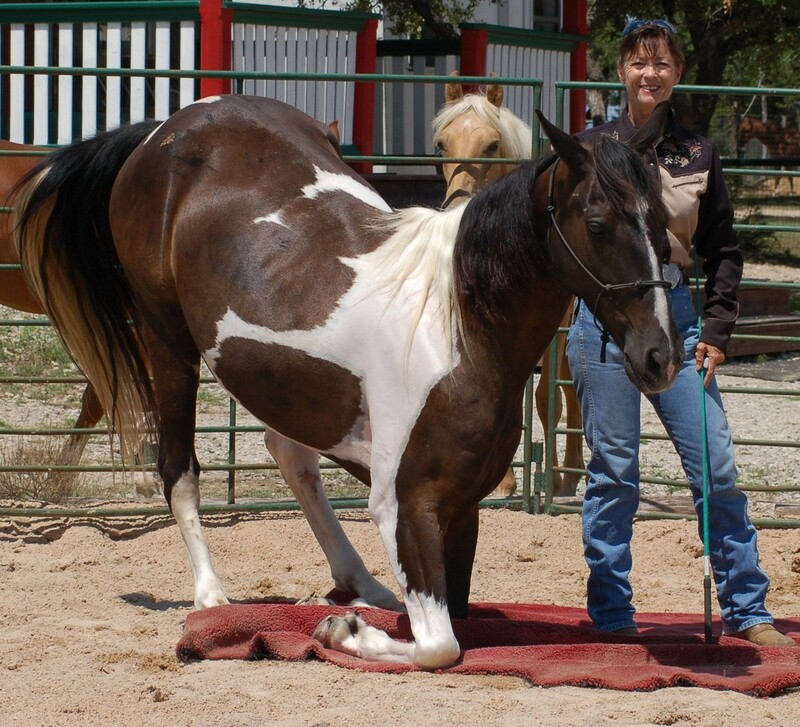 Learning to shape a horse's natural behaviors develops a handler's ability to recognize, understand and reward behaviors. The Smile gives a horse an acceptable learned behavior he can use to solicit attnetion and interactions. The Salute or Jambette is the foundational move for the Spanish Walk. 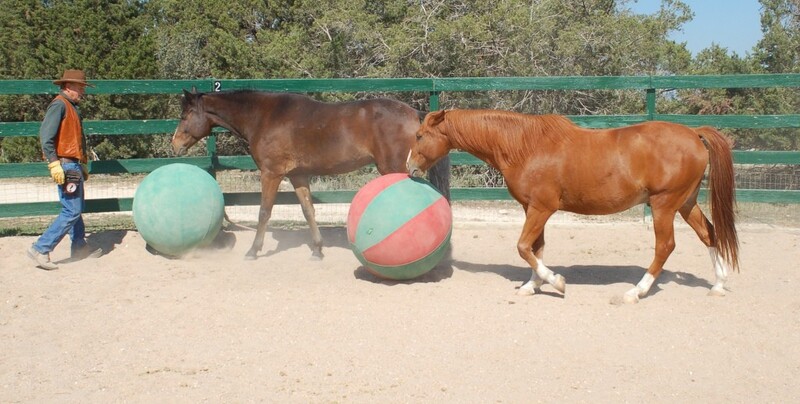 Controlling the Big Ball brings out the herding instinct in horses and increases focus and attention span. Allen also will teach you how to link separate tricks together to create a Behavior Chain. Teach the Retrieve from beginning to advanced work. 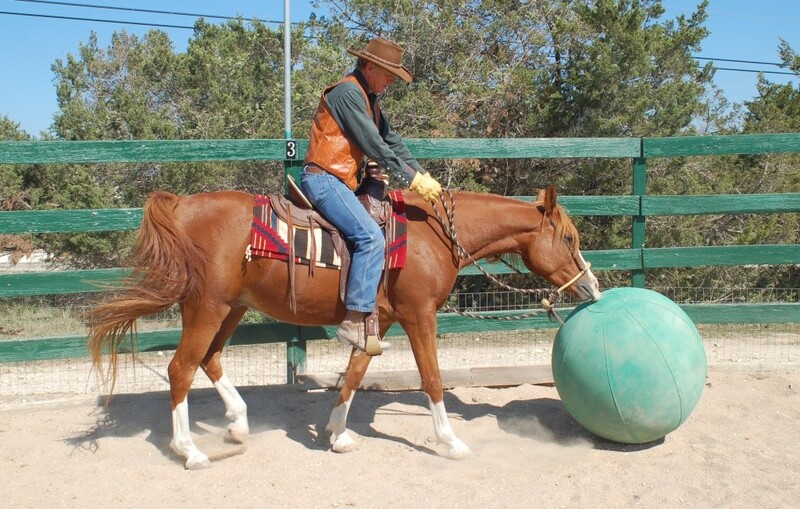 The Retrieve is a trick that dramatically improves a horse's focus and attenton span. 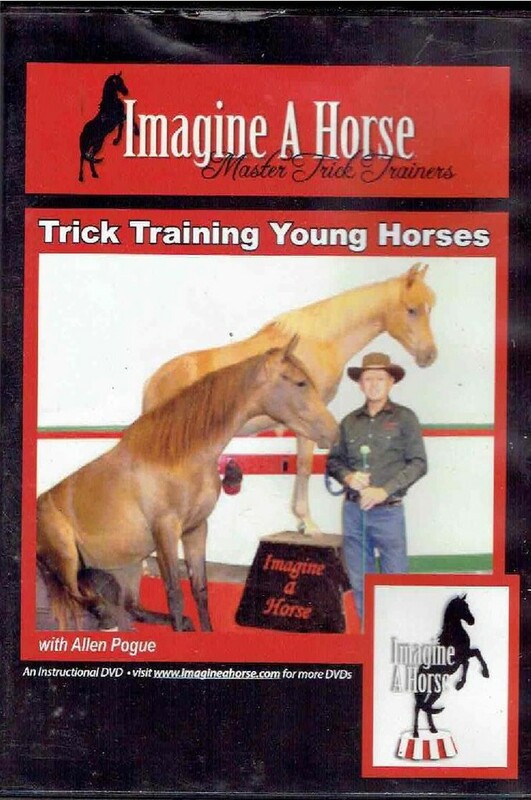 No one teaches it like Master Trick Trainer, Allen Pogue. 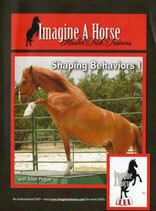 Instructions include using a horse friendly frisbee, the Toss and Retrieve Ball and a cap or hat. 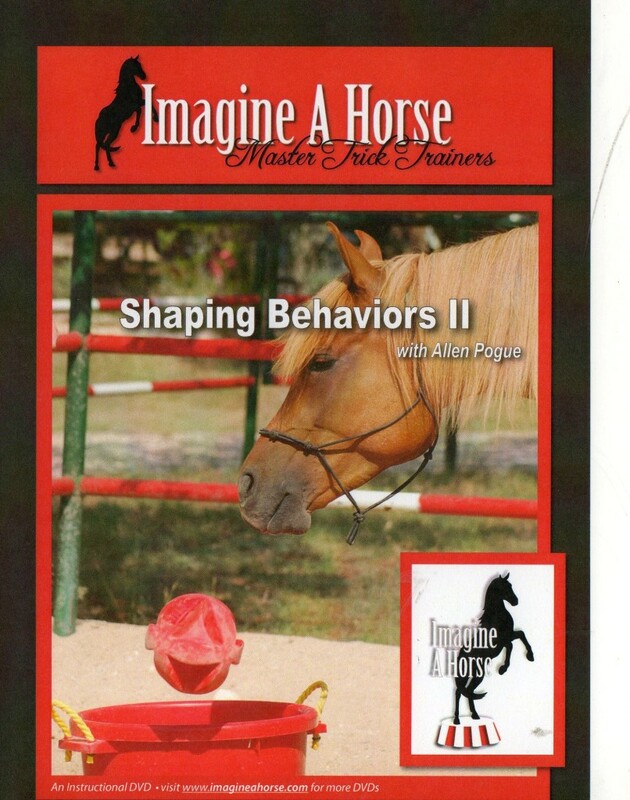 Also learn to create Advanced Behavior Chains by linking together individual behaviors or tricks with methods that make it easy for a horse to understand and respond. 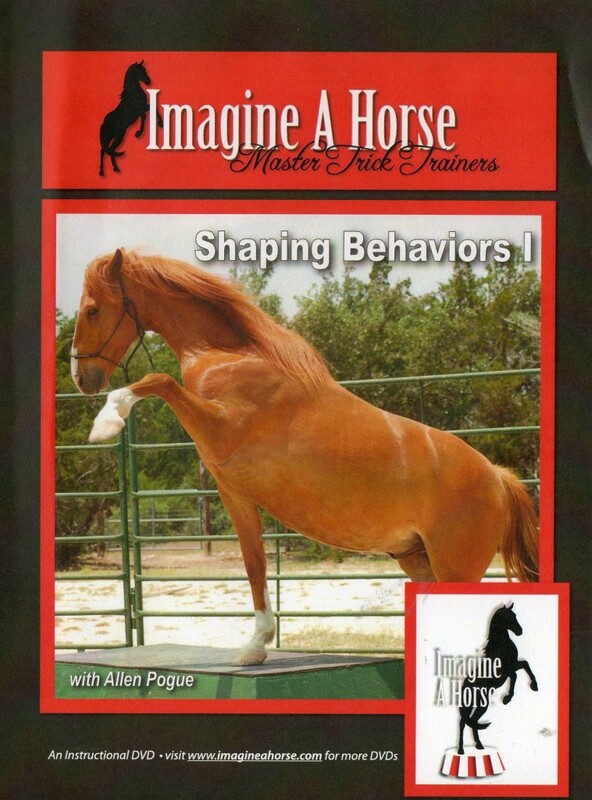 Package price for both Shaping Behaviors DVDs. Training the Rear is taught as the continuation of Pedestal Training. 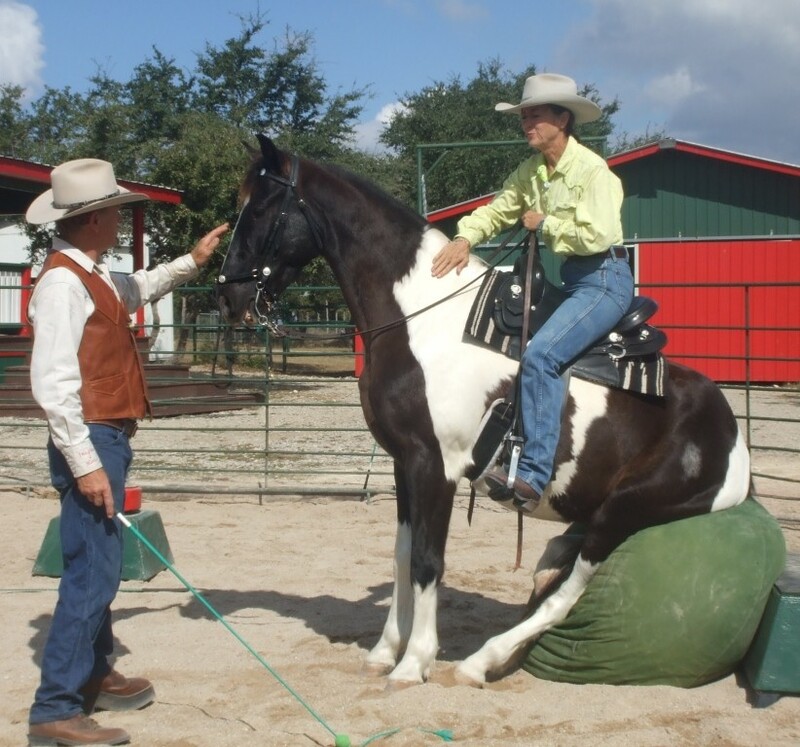 Handler safety and attention to the horse’s reliability are covered. We use a Climbing Wall to help create strength and balance and turn the Rear into a true gymnastic move for the horse. Novel yet simple method with no stress to the horse! 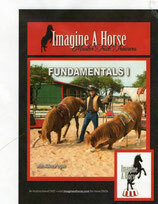 Includes also how to transfer teaching the Rear from the ground to under saddle. A glimpse into an inspirational day of play...Lady C and Sue, her long time companion and trainer. 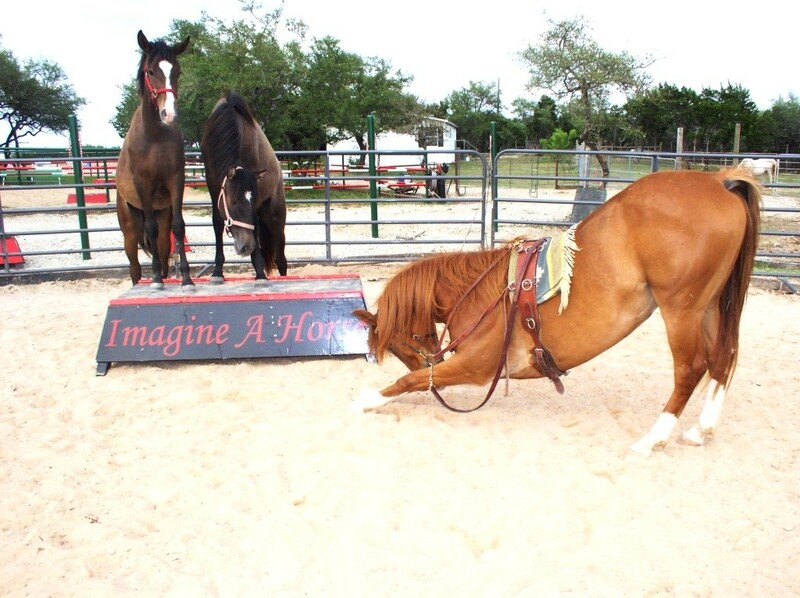 Lots of footage from Imagine A Horse location in Texas and from the Sound Horse Conference. Lots of photos of and music by former owner, Sheryl Crow. Lady C's message is "pure positive". 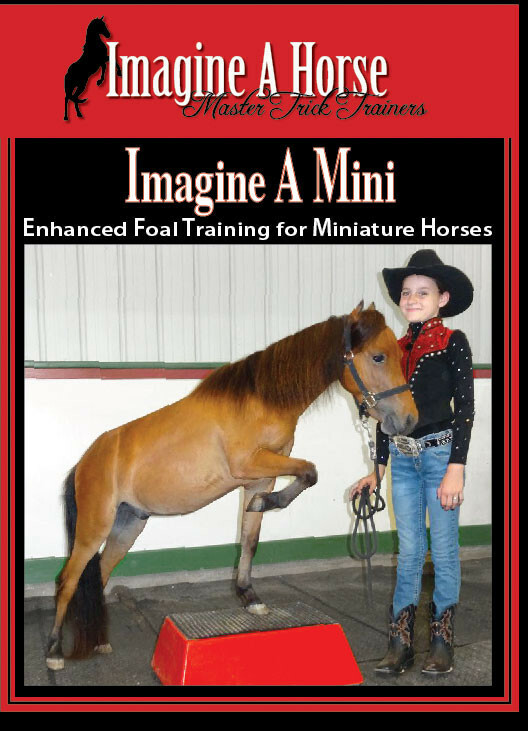 Make learning fun, use your imagination and positive reinforcement methods and there is no limit to what your horse can do. We are happy to ship anywhere in the world! If you have questions about International shipping please just call or email us. There will be an extra charge if you request insurance against loss or damage. It is impossible to have enough buttons to cover shipping costs to every corner of the world. Shipping to Canada is somewhat less than shipping to Australia and we will refund any excess charges automatically applied. When we ship, if the shopping cart service has miscalculated or over charged (automatically) the shipping fees, we will promptly refund any excess amount. 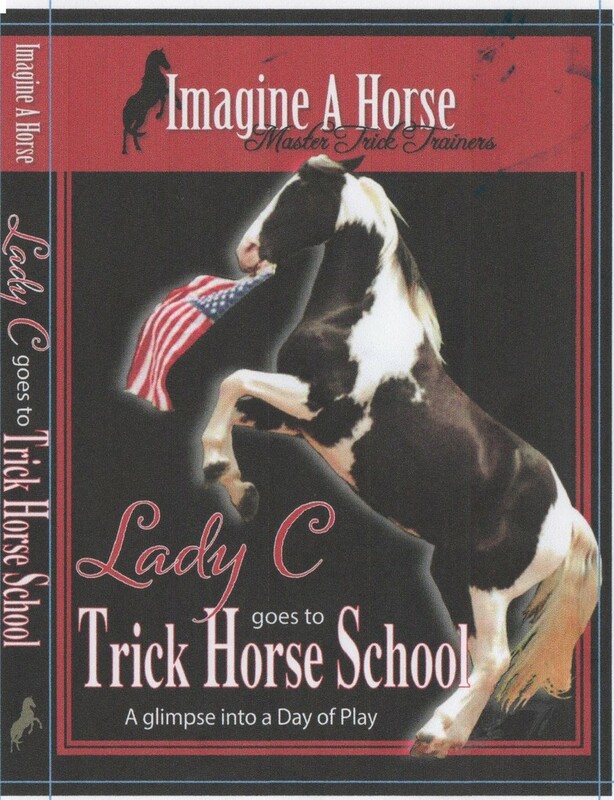 Value package all 13 Imagineahorse DVDs plus bonus Lady "C" goes to Trick School.